7 Awesome Stats from NFL Week 16 - Fantasy Football, Fantasy Football Rankings | Mac Bros.
Week 16 of the NFL season has nearly come and gone. Let's look back at 7 feats of statistical awesomeness. 1. The New England Patriots erased a 17-0 deficit to defeat Miami 27-24. It marked the 10th time this season that a team trailed by at least 17 points and came back to win. That is the most in a single season in NFL history. With the win today, the Patriots clinched a first-round bye in the AFC playoffs. 2. The DETROIT LIONS defeated San Diego 38-10 to secure the team’s first playoff berth since 1999. Detroit quarterback MATTHEW STAFFORD passed for 373 yards with three touchdowns in the victory. Stafford now holds the franchise record for passing yards (4,518) and touchdowns passes (36) in a single season. 3. Today marked the first time in NFL history in which two different quarterbacks threw a 90+ yard touchdown pass. Carolina rookie quarterback CAM NEWTON threw a 91-yard touchdown pass to wide receiver BRANDON LA FELL in the second quarter against Tampa Bay. New York Giants quarterback ELI MANNING connected with wide receiver VICTOR CRUZ for the 13th 99-yard touchdown pass in NFL history. Manning and Cruz joined New England’s TOM BRADY and WES WELKER (Week 1) for the second 99-yard touchdown pass this season. This is the first season in NFL history with two 99-yard TD passes. 4. 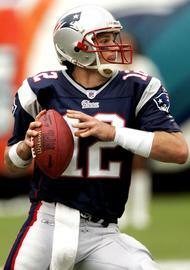 New England quarterback TOM BRADY passed for 304 yards with three touchdowns (two rushing, one passing) against Miami. Brady now has 297 career touchdown passes and 10 rushing TDs. Brady joins Pro Football Hall of Famers JOHN ELWAY (300 TD passes, 33 rushing TDs) and FRAN TARKENTON (342 TD passes, 32 rushing TDs) and BRETT FAVRE (508 TD passes, 14 rushing TDs) and PEYTON MANNING (399 TD passes, 17 rushing TDs) as the only players in NFL history with 297+ TD passes and 10 rush TDs. 5. New York Giants wide receiver VICTOR CRUZ had three catches for 164 yards, including a 99-yard touchdown reception in the Giants’ 29-14 win over the Jets. Cruz now has 1,358 receiving yards in 2011, the most in a season in franchise history. Carolina’s Newton threw three touchdown passes and added one rushing touchdown in the Panthers’ 48-16 win over Tampa Bay. Newton (3,893) surpassed PEYTON MANNING (3,739 in 1998) for the most passing yards by a rookie in NFL history. Newton (20 passing TDs, 14 rushing TDs) is the second player in NFL history with 20+ TD passes and 10+ rushing TDs in a season (KORDELL STEWART in 1997). Cincinnati’s Dalton threw two touchdown passes in the Bengals’ 23-16 win over Arizona. Dalton (20) and Newton (20), tied Pro Football Hall of Famer DAN MARINO for the third-most touchdown passes by a rookie in NFL history. This is the first season in NFL history with two rookies to pass for 20 TDs apiece. 7. Pittsburgh running back RASHARD MENDENHALL rushed for 116 yards and one touchdown in the Steelers’ 27-0 win over St. Louis. In his fourth season, Mendenhall has 29 career rushing touchdowns and surpassed Pro Football Hall of Famer FRANCO HARRIS for the most rushing touchdowns in the first four seasons of a career in franchise history.